Music has a way of expressing that which cannot be put into words. It is for this reason (and many more) that music is regarded as one of the triumphs of human creativity--but does music itself help one to create? People like me need to know. For nearly all of my work sessions, I have music playing in the background. I once wrote 10,529 words on customer loyalty (how exciting) listening to nothing other than the SimCity 2000 soundtrack--and yes, more on that later. When evaluating music’s effectiveness in increasing productive output, one element to consider how “immersive” the task at hand is. This refers to the variability and creative demand of the task--writing a brand new essay from scratch is synthesis work that demands a lot of creativity; answering your emails is mundane work that does not. A series of experiments has investigated the relationship between the playing of background music during the performance of repetitive work and efficiency in performing such a task. The results give strong support to the contention that economic benefits can accure from the use of music in industry. More modern studies would argue that it perhaps isn’t the background noise of the music itself, but rather the improved mood that your favorite music creates that is the source of this bump in productivity. The effects music can have in relation to repetitive tasks were further explored in this study, which showcased how assembly line workers displayed signs of increased happiness and efficiency while listening to music. Despite the somewhat variable effects of music on the individual, one thing is definitely clear: A noisy workplace can end up halting productivity in its tracks. While the open space may encourage more collaboration, the chatter can be too much for some people to handle--I know that when I’ve worked in an open workspace, I couldn’t focus on writing without my headphones. 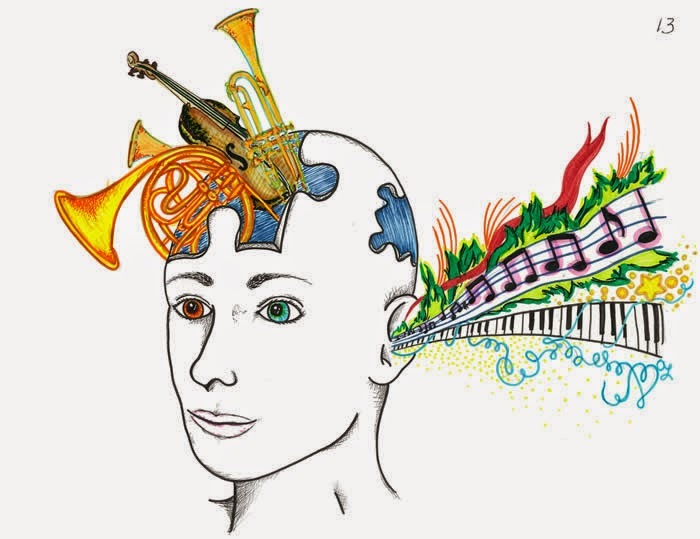 Music demands too much of your attention--even when the sounds are subtle--to be listened to when you are trying to learn or analyze new information. Imagine trying to “read above your level,” or reading material that is outside your expertise, while being pulled away by the sound of music. It makes an already difficult task nearly impossible. For those that do benefit in listening to music during creative sessions, an “ambient” presence of music appears to work best. Since listening to words activates the language center of your brain, trying to engage in other language related tasks (like writing) would be akin to trying to hold a conversation while another person talks over you… while also strumming a guitar. Lyrics might not have the same effect for creative tasks that don’t directly deal with “verbal architecture,” such as designing. This study that looked at software developers suggested that music helped their output while working; I would still argue that for any language-based task, you should steer clear. The reason being is that new music is surprising; since you don’t know what to expect, you are inclined to listen closely to see what comes next. While the “journey” of new music is certainly beneficial in other ways, you may want to tread a familiar path if you are using music to help get things done. Obviously “music that you like” should be given preference, but there are certain types of music that, from the research above, might be best suited to make us all more productive during immersive tasks. I chose to look at this in particular because music for more repetitive tasks tends to be an “anything goes” situation: if Metallica helps you get through your inbox, turn it up until your neighbors complain. In addition, most people tend to have a fairly wide range of music interests, so coming across or utilizing a certain type of music just for work isn’t out of the question--they needn’t always rely on what’s currently on their iPod. Below, in order to introduce you, I’ll list the type of music, why it may be useful for you, and I’ll try to include some links on where you can find more. One study in particular made it very clear that Baroque-period tunes appear to have a measurable impact on productivity. The study only had 8 radiologists as subjects, however all but one reported that the classical music had a notable improvement on their concentration. Noting what we’ve discussed above, not all classical music is created equal here--the dramatic twists and turns of "Toccata & Fugue in D minor" might not be as appropriate as the more delicate sounds of "Für Elise."